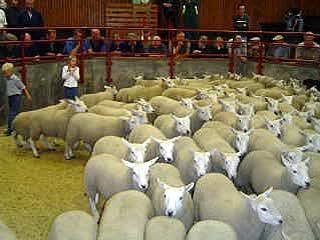 The Cumberland & Dumfriesshire Farmers Mart PLC had forward 1,789 store lambs at their weekly sale at Longtown on Tuesday 4th August 2009. Another very good show met a sharper trade from a packed ring of customers, with the overall average up £10.88 on the year. Top price of £58.20 for Texels from Priorsford, others £52 Williamswood and Howard House; Greyface £50 Knarr, £49 Sanders Close, £47.50 Bateyshield; Suffolk £49 Haswellsykes, £47 Cumstone; North Country Cheviot £47 Hownam Grange; Charollais £45 Dacre Road; Hill Cheviot £38.80 Kelsocleugh; Swaledale £21 Naddle. Suffolk cross Mule ewe lambs to £54 Haswellsyke.